J/News Articles: 2019 Block Island Race Week Announcement! 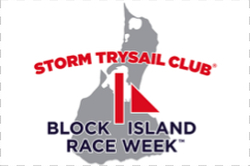 (Block Island, RI)- The 28th Edition of the famed Storm Trysail Club Block Island Race Week will take place from June 23rd to 28th, 2019. The STC Committee expects 150 boats and the number of racing formats has been expanded to attract an even wider array of yachts; ranging from Grand Prix teams to family-friendly cruising boats. Besides the usual Windward/Leeward racing, there will be Pursuit-start and ‘Solent-Style’ racing formats, too. IRC, ORC and PHRF are returning, as one might expect. In addition, an exciting, new, innovative format will be introduced– “Plus+1”. Plus+1 allows the crew to be one person larger than the first digit of hull-length. (30-39’= 4 crew, 40–49’= 5 crew, etc.) Plus+1 fills a sweet spot between double-handing and fully crewed racing, lowering costs and the need for crew. The Plus+1 class will be sailing a windward/ leeward course in the morning and a “random-leg” race around government marks in the afternoon. They will also do the famous Around the Island Race on the day the whole fleet goes around. Easier to find enough crew. Reduces the time e-mailing and calling. Everyone on the boat has a lot of jobs to do. No bored rail meat. It's safer. If someone gets hurt or goes overboard, two or more people can help. Teams can sail in a broader range of events; windward/ leewards, race around government marks, and classic distance races. Saves money. Fewer lunches and fewer post-race cocktails to buy. Rent a smaller house! Sail with your friends, not your friends’ friend. Over time, J/Sailors have been big supporters of their favorite summer race week on the East Coast. Starting in 1977, the J/24 sailed against the best the MORC Class had to offer and won by a significant margin. The rest, as they say, was history. Having started an “instant legacy”, droves of J/24s, then J/30s, J/35s, J/29s, and J/44s up to the recent offshore sprit machines like the J/105, J/109, J/111, J/88, J/122, J/120, and the new J/121, will continue to expand on that legacy of J/Boats participation across the board. 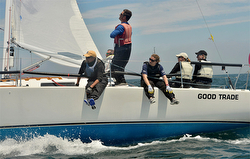 So far, twenty-three J/Teams have signed up for PHRF, ORC, and one-design racing (J/88, J/105, J/109). Will the EVERETT B. MORRIS MEMORIAL TROPHY Winner (emblematic of the Overall Winner of BIRW)- the J/105 GOOD TRADE (sailed by Bruce Stone, Nicole Breault, Marc Acheson, Bill Higgins, John Sahagian, and Casey Williams)- repeat their performance from 2017? You will need to go sailing to find out! Come one, come all, it’s an amazing event run by crackerjack Race Committees and PRO’s organized by the Storm Trysail BIRW Committee. Sailing Photo Credit- Alan Clark/ PhotoBoat.com. For more Storm Trysail Club Block Island Race Week sailing information Add to Flipboard Magazine.